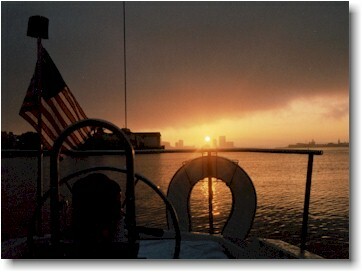 I sailed out of San Diego (N32.41, W117.08) on November 1st. Mike, the American skipper from Garmisch Partenkirchen, and my friend John Morgan from Austin were part of the crew for the first 10 days down the coast. 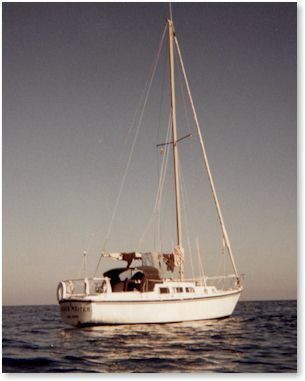 Our ship, a 30 foot (10 m) Coronado 30 called 'Immer Weiter' (German for 'Ever Onward'), was an easy going family cruiser that barely offered space for three on board. Equipped with a 150% Genua that could be rolled up to shorten its size, the ship was able to cruise at around 5 knots (7 mph or 9 km/h). Medium winds of forces 2 and 3 (around 15 knots) from the North allowed for easy sailing down wind on broad reaches or runs. On these courses, the boat is almost at level, rocking occasionally smoothly from side to side, and surfing up and down the seas that pass from the back. Even though John didn't have any sailing experience, we integrated him into the watch schedule so that each one of us steered for 4 hours before resting for 8. First evening on board of "Immer Weiter"
In occasional high seas (up to 9 feet or 3 m) we enjoyed smooth sailing at good speeds. The nights were cold but free of clouds and the stars above the horizon overwhelming. From the cockpit of a sailing ship one can see as far as about 12 nautical miles (15 American miles or 20 km), black in moon-less nights, glimming black and silver when the moon is up. Sometimes, we would see the small lights of other ships - but never close enough to identify what kind of a ship they were. Only cruise ships are easy to identify: They are lit up with multiple lights ('like a Christmas tree') that shine far across the water. Whereas we would take more than two hours to make it to the horizon, a larger ship can bridge the distance in about half an hour - enough reason to continuously watch the horizon and keep track of what other ships are doing. Aside from this, steering is stress-less and, at the courses we were steering, only requires watching the compass to sail into the right direction. 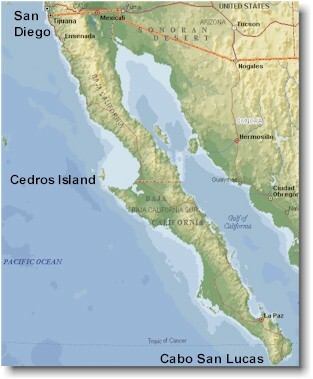 We were going south with courses around 180 degrees, heading for Cedros Island in front of the Mexican coast. We mastered the 300 nautical miles in 5 days. Shortly before reaching the island, the only stronger breeze on this stretch came up with up to 5 forces and winds around 20 to 25 knots. On a beam reach we were taking the wind from the starboard (right) side and were leaning up to 30 degrees. A good test to see whether all material on and under deck was stored safely. While John was sleeping, Mike and I ran our first reefing maneuver and shortened sails to be able to continue to steer the right course. Half an hour later, we sailed into the wind shade of the island and ended up motoring to our first anchorage. Going ashore in a new harbor requires an extensive check-in procedure at the port captain and immigration offices. While the ship stays at its anchor off shore, we take the little dingy with its 2 horse power outboard engine to go ashore. A land fall allows for some walking on solid ground, a meal not cooked out of a can, and taking in the local scenery of a remote Mexican town and its people. We also made some repairs to the ship, sending Mike twice up the mast. After a day of rest and a smooth night on anchor with 10 hours of continuous sleep, we set sails again for Cabo San Lucas. To better manage the next 400 miles, we decided to turn into Bahia Magdalena, a remote Mexican bay, for a nights rest. The town of Puerto Magdalena consists only of a few houses, some dirt roads, and has to generate its own power with a generator than only runs from 7 to 10 at night. The only restaurant offered lobster or machaca, and even sold us a block of ice - so important for the cold beer and coke on board. 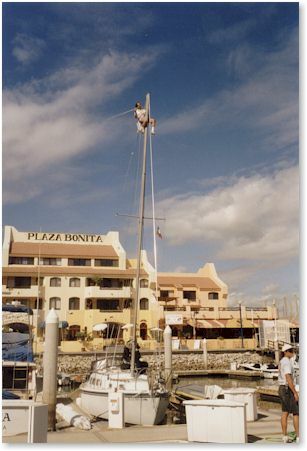 After 11 days we reached Cabo San Lucas (N28.04, W115.11) on the south end of the Bahia California where Mike and I decided to stop for 5 days in its well developed marina. Hot showers, laundry facilities, shore power and water, and a well established tourist town with lots of restaurants and bars were there to explore. The 'World's Smallest Bar' and its two cute bar tenders fulfilled our desire for civilization completely. The long and cold nights at sea and damp clothes penetrated by never drying salt water, had made us desperate for days ashore. Cabo was heaven for us! John had to return to his busy live at Motorola and left us after three days. Mike and I decided to change our plans: Initially, we wanted to cross the Pacific and make it to Australia. After being at sea for several days and experiencing the stress caused by rocky and sleepless nights, we decided against 2000 miles to Hawaii and changed our route to point South-East down the coast to Panama. This would allow for shorter stretches with lots of coast to explore. There are only so many things you can do on a small boat and the ocean does start to look the same after a couple of days. Visiting remote ports in Central America and cruising down its coast seemed to offer some changes in our lives as sailors.